The new DRAGONFLY 32 EVOLUTION looks like an exciting evolution of the popular Dragonfly 32 Supreme model, featuring new high-volume wave piercing floats for fast and relaxed sailing. This new float design improves the Dragonfly’s performance in stronger wind and wave conditions, expanding its offshore capabilities. In detail, it gives 20% more buoyancy in the floats and 20 cm extra in the boat's overall beam.In addition, the buoyancy center is located lower, which overall gives more initial stability and means that the boat can be pushed further in strong winds. The profiles of the floats are lower, which results in a less wetted surface in light wind. 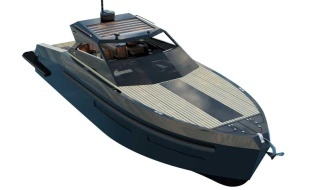 It seems that the boat has become sportier to sail and more agile and responsive at the helm. 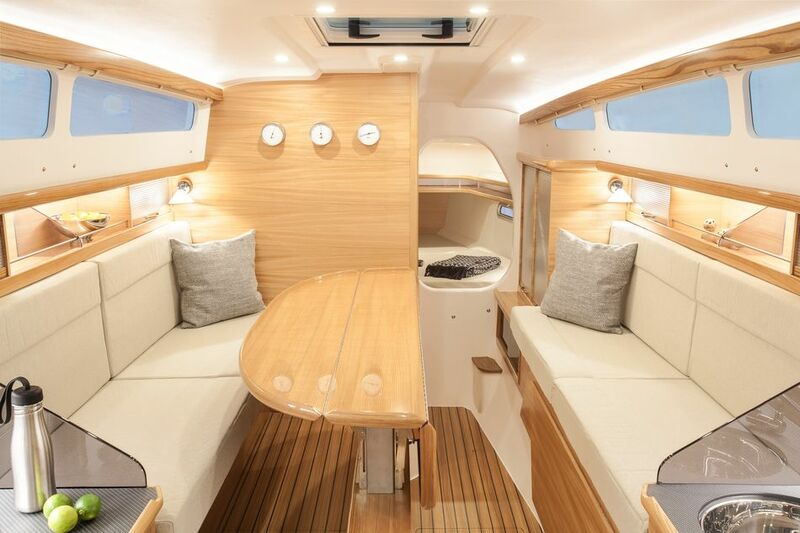 As for the interior the new Dragonfly 32 Evolution offers a new design in varnished elm-wood giving it a bright, modern and cozy look. The Dragonfly 32 features the famous ‘Swing Wing’ system designed more than 25 years ago, allowing the impressive multihull to be accommodated in a monohull berth. You’ll enjoy an abundance of space below deck – the working surfaces and the saloon are transformed by the recessing of the centreboard, thanks to intelligent and thorough 3D design of the central module and the structural interior moulding. The Dragonfly 32 comes with six full-sized berths, all of 2 m length. Up front, there is a double V-berth, and the aft cabin offers a comfortable double berth. The interior layout is fitted out in maple wood as standard, with luxurious teakwood interior optional. 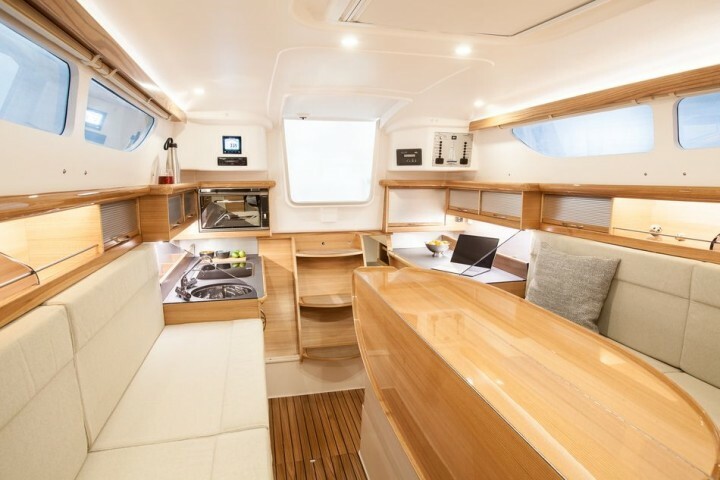 Six to eight people can be seated comfortably on the main dinette table, and the functional galley is located centrally by the companionway. For the past years, Quorning Boats has been working on the design of the new generation of wave piercing floats, which they developed for their Dragonfly 25 model and later for the Dragonfly 28 Performance. Now, they take this a step further and implement the wave-piercing hull design and technology in the Dragonfly 32 Series with the new Dragonfly 32 Evolution. 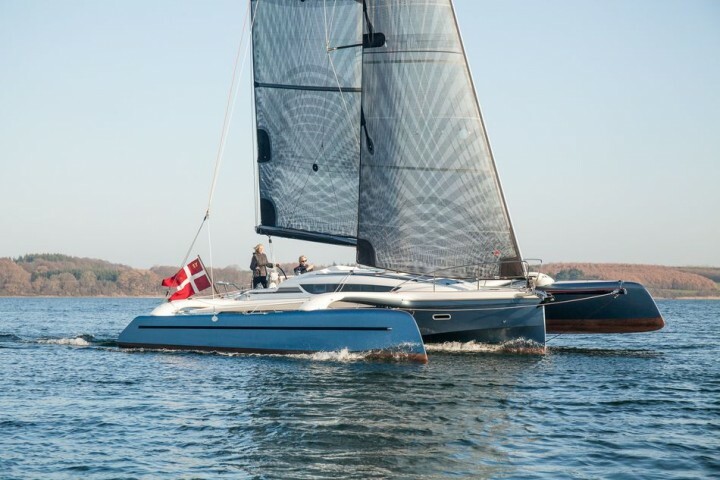 The new Dragonfly 32 Evolution will premiere on Jan 19-27, 2019, at the boot Düsseldorf 2019.